The aim of the research is to study how motivation effects differentiation of entrepreneurs. This research started by doubting the simplification of entrepreneurs by dividing into two or three categories: survival and growth oriented entrepreneurs as well as constrained gazelles. Adapting entrepreneurial process (Shane et al. 2003), it focused on influence of motivation of entrepreneurs over entrepreneurial process. Motivation was regarded as passion and differentiated from motives. The field research was conducted in Busia Country, Western Kenya, through interviewing 40 poultry farmers. The findings from the research were as follows. Firstly, the relationship between entrepreneurial motivation and performance of the farmers were not clear. Secondly, the motives to start poultry keeping were income generation, securing food and security reasons. Thirdly, it also successfully unveiled that motivation was obtained through CABE interventions even after having been engaged in the activity. Finally, this paper found that motives exist no matter what entrepreneurial activities they operate while entrepreneurial activities matter for motivation in a way that entrepreneurs need to see possibilities to achieve motives. This paper also argued the differences among entrepreneurs in terms of motivation. They were named as Constrained Geese, Taking-Off Survivalists, Great Survivalists, Upper Survivalists and Lower Survivalists. Each group has features but significantly Constrained Geese had new ideas on poultry production with well-arranged environment for poultry keeping and Taking-Off Survivalists were ready to go for the next step by arranging the environment for poultry keeping. Great survivalists were still interested in other activities for achieving their motives, they were aware of opportunities of poultry keeping in order to obtain their motives. It should be mentioned that these groups were simply named for convenience and there were more degrees within each stage. Following these findings above, it turned out that motivation influences differentiation of entrepreneurs by making entrepreneurs engage in the activity. The more motivated, the more committed and invested. As entrepreneurial process goes, they are more likely to be involved in activities no matter what the motives are. The perception would give a new perspective to the argument on entrepreneurs in the development. 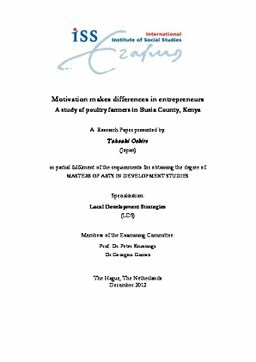 This research would contribute to the argument on entrepreneurs by casting degrees of the farmers. By acknowledging these degrees, we might be able to understand what are entrepreneurs and their features correctly thus better interventions would be implemented by following the differences among entrepreneurs.